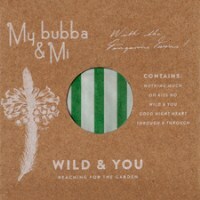 Back with another lovely and sweet compilation, My Bubba & Mi just recently released a 5-track EP, Wild & You. Coated with beautiful folk melodies that the girls are known for, this mini-EP is filled with delightful cuts perfect for quiet and relaxing afternoons. Most of the songs from Wild & You echo the band’s original melodic folk sound. Each track runs under 3 minutes, giving the listeners enough time to fall in love with each single without dragging it out too much. If there’s one thing I adore about this band, it’s the sense of familiarity they provide their audience. Like that simple ditty you used to sing when you were a kid or maybe your old bedroom from home; it feels as if you know the songs from a long time ago. Opening song, Nothing Much, welcomes listeners with open arms as the ladies hypnotically combine lovely vocals with enchanting and sweet lyrics. It’s followed by a more country folk jazz track, Oh Kiss No. The vocals reminds me of those singing sirens from the 50s. The ladies step up the pace a bit with their honky tonk country homage and title track, Wild & You. Meanwhile, the remaining tracks, Good Night Heart and Through & Through perfectly cap the record. The former is an endearing acapella while the latter captures the essence of the band’s sound. If you’ve heard of these gals before or perhaps listened to their first album, then you’ll certainly love this compilation. If in case this is your first time, then you’re in for a real treat. Take a listen and enjoy!